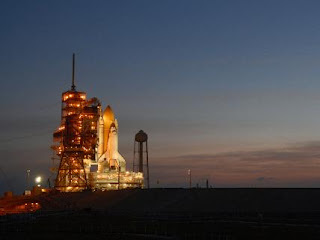 Discovery is set to launch tonight at 5:02 pm EDT. Discovery will have the largest payload to the International Space Station to date. They will be delivering and installing the pressurized module for the Kibo lab as well as the module's robotic arm system. Discovery will also be delivering parts for the station's broke toilet. That's right they have a broke toilet....... wait, they only have one toilet? I know from experience, after at one time living with 3 women, 4 if you count the cat that the minimum requirements should be 1 bathroom per person, right now it's just my wife and I and we have 2 bathrooms, that is just sufficient, anything less is criminal. The station houses 3 astronauts, what are they going to do when in the near future the station will be occupied by 6 astronauts? People we are going to see the first death in space and it isn't going to be due to some dangerous spacewalk. Man if I were an astronaut I'd be, well first I'd be saying, is it here yet, is it here yet ,is it here yet... I'm hungry, but I'd be asking the question, " this Japanese kibo module thingy.. has it got a bathroom?" it should be space station code, one bathroom per astronaut. The cost to repair the toilet. 19 followed by 6 zeros, that's right 19 million dollars! NASA said it is cheaper to buy parts from the Russian manufacture for the old one rather then build a new one from scratch, the Russians saw us coming, wow, we can put a man on the Moon yet we can't build a cheaper then $19,000,000 space toilet. 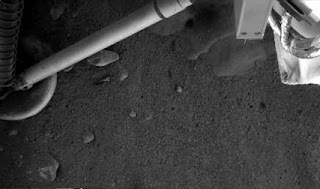 On the Phoenix Mars Lander front, scientists have noticed what they think might be ice that was exposed by the thrusters on landing, just off one of the lander's legs, very cool, they expect to do some digging as early as next week, so excited. A possible short circuit was detected on one of the lander's scientific instruments, the Thermal and Evolved Gas Analyzer, this instrument tracks how much heat is needed to melt or vaporize substances in a sample then examine the vapours driven off by the heat. Scientists are looking into the problem, "We have developed a strategy to gain a better understanding of this behavior, and we have identified workarounds for some of the possibilities," said William Boynton of the University of Arizona, Tucson, lead scientist for the instrument . During the descent stage the Mars Express Orbiter picked up the sounds created by Phoenix as it was descending to the Martian surface, check it out. On my flight back from Kelowna I took a bunch of videos and pics over the mountains, I made one of the mountain images I took from the plane window into an animated gif, looks pretty cool, at least I think so, but I think everything looks cool this way, hey even a toilet. Well people they pulled it off, a flawlessly performed landing on the Martian surface at 7:53 pm EDT Sunday May 25th. by the Phoenix Mars Lander. 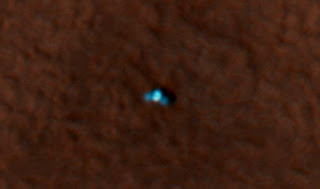 The image above was taken by the onboard telescope from the Mars Reconnaissance Orbiter, it is the lander parachuting to the surface. This was the first successful use of parachutes and thrusters, or what they call a power landing since the Viking missions in 1976. 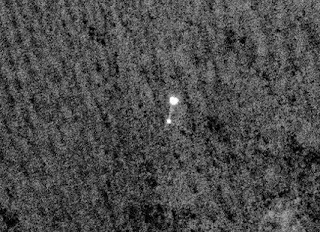 The Phoenix lander (above image taken by the MRO) has onboard scientific instruments to determine whether ice and water on top of or just below the surface could have ever supported life. NASA'S Mars exploration program has 4 main goals. 1: Determine whether life ever arose on Mars. 2: Characterize the climate of Mars. 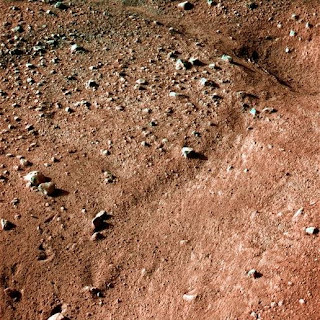 3: Characterize the geology of Mars. 4: Prepare for Human exploration. The Phoenix lander has two main objectives. 1: Study the history of water in the Martian arctic. 2: Search for evidence of a habitable zone and assess the biological potential of the ice-soil boundary. I watched NASA TV for most of Sunday, very exciting, my pulse was racing those 7 minutes during descent and landing. Why am I so excited, and why should you care? Baby steps my friends, that's what space exploration is all about, we ain't gonna be warping to some far off galaxy anytime soon, but every little bit of progress helps us, so that one day we can reach for the stars. I don't just see a lander on Mars gathering ice water, I see a successful completion of a step needed to get us on our way to the outer reaches of the galaxy, nay the universe. Earth is a great place and all, but we only have a limited time before our life supply burns out. Estimates range anywhere from half to a few billion years before our Sun will no longer be able to support us, we have to do what we can to propagate our species, or we can just give up and become extinct. God gave us all the tools we need to complete this objective; curiosity, intelligence, why else did God create the cosmos?, has to be a reason, so many unanswered questions, so little time. I think we are in exciting times, sure I wish I had been born about 300 years from now, I need more technology, like a Holodeck or Replicator, but with our ever expanding space exploration programs and what I think is the most exciting thing to happen in science in a long time; the Large Hadron Collider at CERN, we are setting ourselves up for some of the greatest discoveries of humankind. 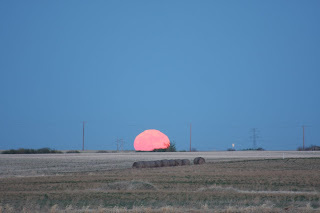 I'll leave you now with an animated Moonrise taken a few days ago. 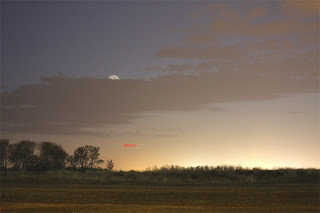 Just before I left for holidays there was a Lunar, Mercury conjunction. Mercury is an elusive target to image as it is small and doesn't stray too far from the Sun. 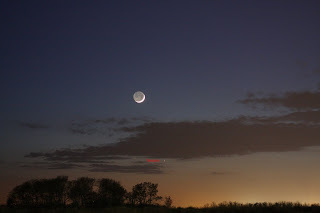 the above image is the Moon with earthshine and Mercury about 40 minutes after Sunset May 6th. Less is more as in the image above, thought the Moon looked cool half blocked out by the clouds. 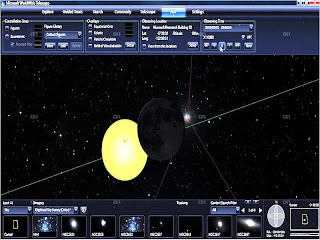 A new free software program was just released May 13th called the WorldWide Telescope. People this has got to be the most frakking gorgeous and informative piece of software I have seen in a long time. It is a Web 2.0 based program so it is very pretty and the interface is very intuitive. Just a reminder the Phoenix Mars Lander is scheduled to touch down on the Martian surface tomorrow at around 7:53 pm EDT. NASA TV will have a lot of coverage starting with a briefing today at 3:00 pm EDT, then Sunday with a news briefing at 3:00 pm EDT, then 6:00 pm EDT Sunday the landing event coverage starts. "I'm hungry", okay the last one wasn't really a question and I don't think I actually said that, .. oh wait, yeah I did, never mind. The first thing you notice when flying into Saskatoon is the total flatness, which can be good if you are taking pictures of Moonrises as the above May Full Moon, or "Moon When Leaves Turn Green Moon" , the name given it by the Dakotah Sioux. 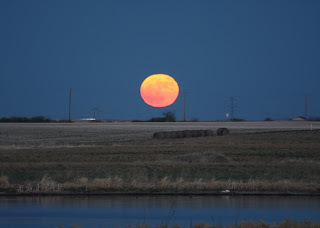 May's Full Moon is also known as the Flower Moon, because that's when flowers start to bloom in places other than Saskatoon, it is the smallest Full Moon of 2008 since the Moon is at apogee (furthest from the Earth) at 252,722 miles, it is approx. 12.3% smaller then the December 12, 2008 Full Moon which will be at perigee (closest to the Earth) at 221,473 miles. 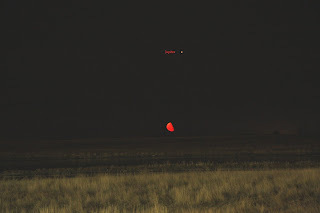 Notice the beautiful red color of the Moon, again this is because the Moon being so low on the horizon it's moonlight has to travel through more of the Earth's atmosphere, particles in the atmosphere scatter the blues and allow the reds through to be enjoyed by us, the picture above illustrates this , the lower the Moon the deeper the red color. This coming Sunday at 7:53pm edt the Phoenix Mars Lander will touch down on the Martian surface. 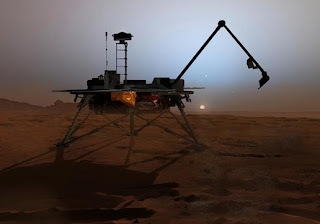 The lander will hit the Martian atmosphere at around 13,000 mph, the use of parachutes and thrusters will slow it down to 5 mph in seven minutes to land on it's 3 legs, a very tricky and complicated procedure, less then 50% of powered landings are successful. Notice on the above map the lander will be further north then any previous landers, hopefully will be able to gather ice water to perform various test to see whether or not it could have supported microbial life. WARNING VIEWER DISCRETION IS ADVISED, didn't know how to edit the first couple seconds of my sequel to my first Observatory video. 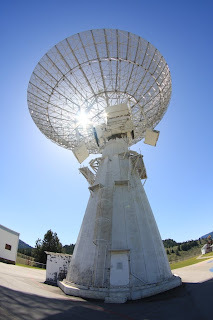 Radio Astronomy is the science of studying radio waves of objects in space, with Radio Astronomy we can see the universe in a whole new light so to speak, we can see things not possible with optical telescopes. 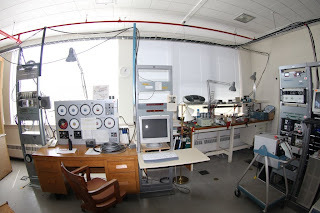 At The Dominion Radio Astrophysical Observatory they study anything that gives off radio waves, they mostly focus on the gases between stars, remains of exploding stars and our Sun. 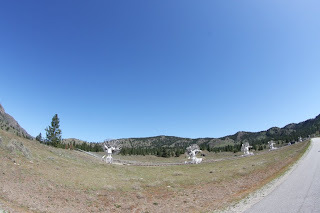 The above image is the 26m Radio Telescope, the observatory also has a Synthesis Radio Telescope which is comprised of seven 9m dishes which when synced together produces a radio dish 600m in diameter, this principle instrument is used to image clouds of hydrogen gas emissions from high energy electrons and magnetic fields in space. 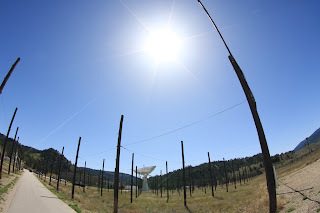 The poles and wires in the above image is also a radio telescope, this telescope is comprised of wire attached between poles, it's like a large short wave radio antenna, it's main function is to gather information about our own Milky Way galaxy. We arrived on site Thursday around noon and since there was no tours available I kinda just walked in some back door and was immediately stopped by some lady asking, get this, if I was a scientist, well I do look the part, had a tote bag around my shoulder, a honking big camera around my neck and gray hair, I was about to answer when a fellow scientist interrupted us, I then asked if I could take a look at their equipment, the other scientist said sure, directed me to their 26m control room, said he be by later, and I was off. What was really cool about this whole adventure , I mean besides being called a scientist is the fact I was left all alone, got some too cool pictures from areas I don't think I was supposed to be in, due to the restricted area signs, I'd be walking around past their lunch room where my fellow scientists were, snapping pics, which by the way I WILL NOT post, otherwise I'd have to kill you and they me. I did take a couple of videos as well, one of the outside and one of just the control center, I will post the outside today, the control center in a later post. On a final note, I just had to blog about my freelance photography moment. 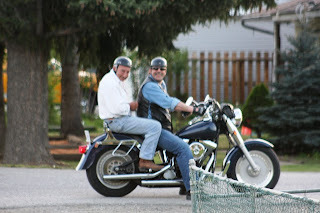 I was taking an image of the Moon in daylight when a couple of bikers drove by and asked if I was a freelance photographer, again looking the part with the gear, I said yes, because I was interested in what they wanted, actually I'm more free then lance, anyways they wanted their pic taken, gave me 20 bucks and I emailed it to them, didn't turn out very good, stupid filter I put on to protect the lens, so I emailed them some of my other freelance work, don't want bikers coming after me. I'd like to thank livingsword again for suggesting this visit to the observatory. I'll leave you now with my first Dominion Radio Astrophysical Observatory video, and by the way my new title is, Bob, Freelance Amateur Astronomer Astrophotographer Scientist.....guy, business cards to follow. Having a great time here in Kelowna, been mostly cloudy so far but I was still able to do some astronomy, the image above was taken when we had a break in the clouds, what is quite remarkable about it is the sky only cleared for about half an hour, and that when it did clear there was a Lunar halo, a nice touch to my Saturn, Regulus Lunar conjunction. the two white dots just above and to the right of the top of the Moon are Saturn,the top dot, and Regulus the bottom dot. 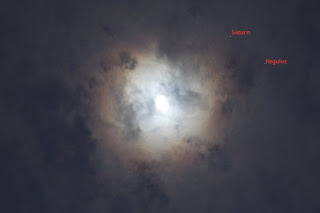 Lunar, Saturn, Regulus Conjunction, May 12, 2008. 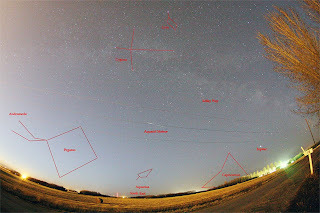 The above image is an image of the conjunction I took just before the sky cleared, the image below was the gathering of the heavenly bodies the night before, May 11, 2008. 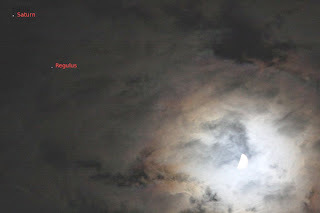 Lunar, Saturn, Regulus Conjunction May 11, 2008. Been taking lots of images with the camera of the mountains, family and various statues, yes people I am officially a tourist. Got my camera bag around my shoulder, my camera in my hand, ready to go. Never really used the camera for taking regular type images, makes sense though, usually have the camera on the tripod , put it in the car, get to point b, take celestial picture, head home. 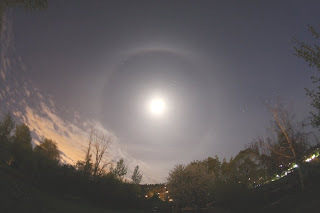 Below are some of my vacation images and an animated gif of my New favorite image, my Lunar Halo. The image above is the view from the restaurant we were at last night. 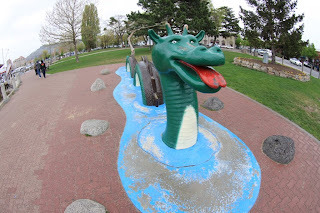 The scenery in and around the Kelowna area is simply breathtaking. Notice the clouds, supposed to be like this for a few days, didn't stop us from driving around though to check out future spots for my dark sky horizon shots. I thought I'd found the perfect spot, a dark country road with tall trees on either side, my thinking, when the Milky Way is directly over head, take the pic, it would be a cool shot, the Milk Way framed by a set of evergreens, that's when the Bear word came up, yes people my new enemy is the Bear, not punk kids in cars, the Bear, stay tuned. Two Weeks from today the Phoenix Mars Lander starts it's descent to the Martian surface, there are a lot of people watching, less then 50 percent of all previous lander missions have made it safely to the surface. 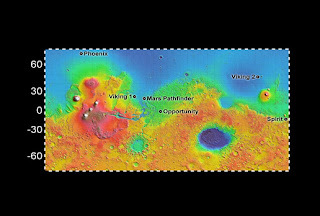 Phoenix will be the first mission to gather water ice from Mars' north polar region, it will then perform experiments on the sample with it's complex on board laboratory to see if it had ever been favorable to microbial life. 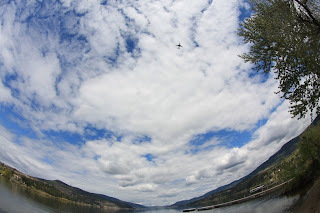 I will be out and around the Kelowna, Penticton area this coming week to take tons of images to post at a later date, hopefully the Bears won't be out to bother me too much, leave you now with a Kelowna scenery shot as an animated gif. 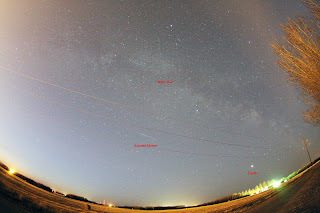 Got some super cool shots of the Aquarid Meteor shower, the Milky Way and Jupiter showed up to play. The weather was perfect, no wind and around +2c. At 3:30 Sunday morning it was very quite except for a lot of critter noises, there were, ducks, frogs, crickets and even birds were starting to chirp. There was another sound, what can I compare it to? you know the sound a monkey makes , you hear it in movies when you're in the Jungle, it goes "ooh, ooh, ooh, eeh, eeh ,eeh, ah, ah, ah, well this monkey or bird because I don't think we have wild monkeys in Saskatchewan, went "ooh,ooh,ooh,ooh,ooh,ooh,ooh,ooh,ooh, over and over again, like the whatever it was forgot the words. The Aquarids are caused by dust particles left behind by Halley's Comet hitting our atmosphere at a high rate of speed and burning up, which by the way just made an appearence back in 1986. So as you're looking at the above meteors you are looking at a piece of Halley's Comet. My daughter sent me the above image of the landscape around Kelowna which I will be visiting starting Saturday. One thing to note when comparing it to one of my above images..... it's not FLAT, which will be a nice change. 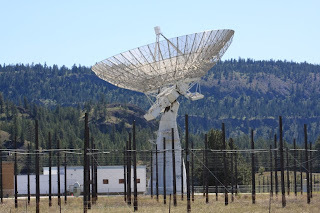 They have a lot of activities planned for us, one being a trip suggested by livingsword to the Dominion Radio Astrophysical Observatory in Penticton. 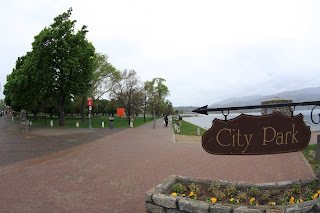 The next post I do will be from the lovely city of Kelowna, probably Sunday. I'll leave you now with an animated gif of one of my better Milky Way shots. Sunday April 27th. 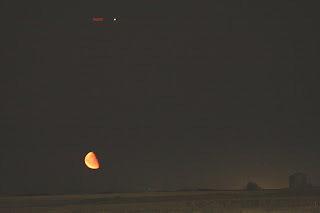 in the early morning hours we had a Lunar, Jupiter conjunction, how early, well it started as the pair rose, around 2:47 am. That's right 2:47 am, now you'd think everyone in their right mind would probably be asleep at that time, unless and of course they knew of the conjunction, not so, it was a busy morning, all kinds of cabs driving people home from the bars, one of my spots is right across from an apartment complex, oh and there were a couple kids doing 360's in their cars behind me in the Shoppers Drug Mart parking lot, hey why not Shoppers had all their parking lot lights on through the whole night even though they close at midnight, I guess they aren't getting with the whole Earth Hour type thing. The image above is a wide angle shot, notice the beautiful red Moon, people ask me, was the Moon really that red, yes,... yes it was, because the Moon was low on the horizon, its moonlight had to travel through more atmosphere, the atmospheric particles scatter the blues of the moonlight and allow the reds through , no photoshop adjustments, actually it was a darker red, almost couldn't see it, it is a lighter red in the image because of the 4 second exposure lightening it up some. The image below, an 8 second exposure again lightening the color. Looking at these pictures can't convey the surrealistic feeling you have viewing it live and in person, it was unbelievable, the red Moon seemed to be floating in a sea of black, too cool. 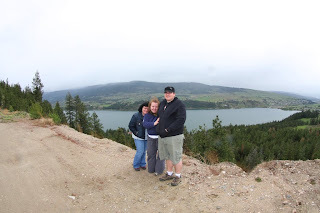 I'm pretty excited, My wife and I will be taking a weeks vacation starting May 10th to visit my oldest daughter Amanda and boyfriend Dave in Kelowna British Columbia. 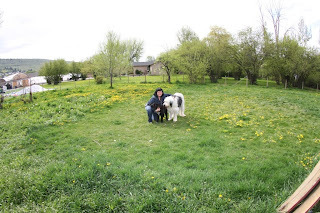 They have two of the cutest, what my wife likes to call Granddogs, one being an Old English Sheepdog Great Pyrenees cross, the other a Newfoundland Great Pyrenees cross, Ill take pics and post. There should be plenty of photo ops with the beautiful weather, the mountains and since they live outside of town there will be lots of dark skies for star gazing, expect some cool photos. A friendly reminder about the Eta Aquarids meteor shower Monday May 5th. 4 am, look to the Southeast just up from the horizon, then Tuesday May 6th look to the West-Northwest 45 minutes after Sunset for the Moon with earthshine, Mercury and Pleiades gathering. I'll leave you now with an animated gif of one of my Moon, Jupiter pics.